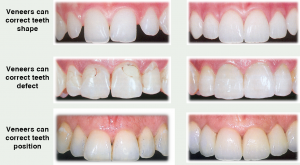 Veneer is actually a thin piece of porcelain, used to recreate the natural appearance of teeth. It provides more strength and resilience as compared to natural teeth enamel. They can be customised according the contour of your teeth and are usually used to close small gaps or correct misalignment. The process of applying veneers takes one to three appointments, depending upon if the veneers are prefabricated or need to prepare in lab according to the case. First, the dentist estimates the correct shade of veneers according to your teeth and a small amount of enamel is removed to fill it with temporary veneer and sample is sent to the lab to prepare the original veneer. Before etching the veneer, the tooth is completely cleaned with pumice and water. Then the light-cured veneer is etched, rinsed thoroughly with water and dried and that’s it. Crown is applied on damaged teeth to work like a cover or cap that provides protection, strengthening and a good appearance. They are made of porcelain or ceramic and can be matched according to the shade of your teeth. Gold and metal alloys are also used to make crowns for teeth specially crowns that build of alloys are recommended for back teeth. When there is not enough tooth remains to recover, dentists suggest to have a crown. They are also used as a protection while restoring a tooth from fracture or after a root canal treatment. To fill up the gap of more than one missing tooth, bridges are used as it prevent other teeth get misplaced because of the empty space caused by missing tooth. They are cemented to natural teeth or implant surrounding the empty space. Teeth that are used as an anchor to support the bridge are called abutments. A tooth which is replaced in place of real tooth is called a pontic, attached to the crown that covers the abutments. Just like crowns, shade of bridges can be matched with the shade of teeth. Crown encases the entire tooth whereas veneers cover only the front part of the tooth. Crowns are thicker than veneers. Wafer thin veneers are only 1mm thick and hence there is no need to trim the tooth to greater extent. On the other hand, dental crowns are 2mm thick and require a large section of tooth enamel to be removed. Veneers have been found more brittle than crowns and are used for minor changes or give a better tooth colour. However, they offer a stain-free surface. On the other side, if the tooth is damaged badly or decayed, then crown proves to be worth as it provides more strength than that from veneers. The cost of porcelain veneers range from 8,000-15,000 according to the quality and life whereas the cost range of dental crowns varies from 4,000-10,000 depending upon the material used. Gold and silver crowns cost higher than the ceramic crown which is not needed to be specified. Get world-class Dental Smile Makeover by Experienced, Best Cosmetic Implants Dentist India Dr Mansi Patel.